Bloom's Taxonomy Model was first introduced to me during my PGCE training as a hierarchal model which every teacher should consider incorporating into their lessons and curriculum plans as it helps to assess and structure learning on a variety of cognitive levels. It was a very �fashionable� buzz word then- so I was naturally keen to try it out. Here is my adventure with it. 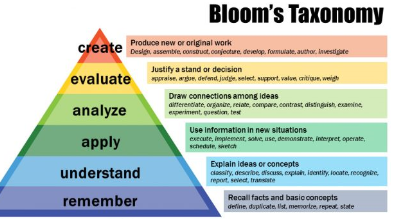 Bloom�s Taxonomy is a hierarchal model which classifies learning objectives and goals into different levels of complexity, engendering higher-order thinking skills as a result. By providing a hierarchy of levels, this taxonomy can assist teachers in designing performance tasks, crafting questions for conferring with students, and providing feedback on student work. The illustration below illustrates the hierarchal structure of Bloom's Taxonomy, where �remembering� is considered to use minimal higher-order thinking skills and �creating� is the highest form, encouraging students to design and transform their ideas into a new model. However, like other taxonomies, Bloom�s is hierarchical, meaning that learning at the higher levels is dependent on having attained pre-requisite knowledge and skills at lower levels. So how can Bloom's Taxonomy be used to enrich your lessons? Apply the concept of Socialism and Capitalism to �An Inspector Calls�. Create an interview with members of the audience, when Inspector Calls was first performed, and find out their views on Mr Birling's actions and character. How can Bloom's be used to enrich your questioning? During one hazy L&T briefing, one English teacher who shall remain anonymous handed out a list of questions based on the Bloom's Taxonomy model and encouraged us to use it. This was a game-changer. 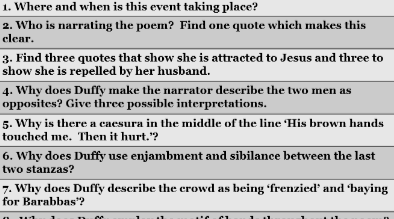 With a copy of �Of Mice and Men� in one hand and the list of questions in the other, I rushed to my year 9 lesson and wanted to see how the questioning would work in practice. I looked down at the chart- first, I asked them about what they remember about Curley�s Wife. Next, can they explain why she is presented this way? Finally, can they judge how much sympathy the reader feels towards her based on a couple of quotations from the novella? My questioning found a flow and I felt that the more I practiced the questions, the less I looked down at my prompt sheet. Recently, I came across this �questioning flower/fan� which correlates questions to Bloom's categories of thinking. It took me an hour or two to put together but it is a SMART resource which can be used with various classes and I will definitely re-use it, hopefully claiming back some time. Just to give you an example, I have used it recently when reading a chapter of �The Great Gatsby� with my Year 12 students. I got my students to pick a random colour and come up with a question using the template such as �Can you distinguish between �young money� and �old money� in the opening chapter?' They then nominated another student in the class to answer the question they created. The students questioned each other initially and then I bravely offered to be questioned by them�which they seemed to enjoy a lot! 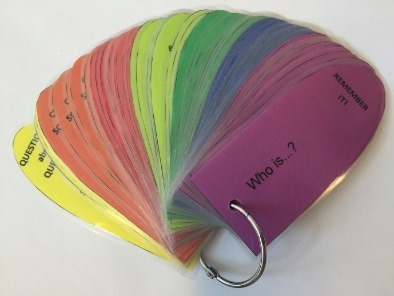 Bloom's Taxonomy can also be used in a �Questions Race� where students are divided into groups of 3 and encouraged to take on the role of a �scribe�, �challenger� and �runner�. The questions are, of course, differentiated using Bloom's Taxonomy and present students with increasing difficulty. Let me know if you would like to see any of those tools in action and we can arrange a time for you to come in and see how I have incorporated them into my teaching. I also have a copy of Bloom's Questions mentioned above and the template for the 'Questioning Fan' to share if you are interested, . If you have any other SMART questioning tools, or your own interpretation of Bloom's Taxonomy, please share them with me as I am keen to try out new methods!